I love vintage children's book illustrations and postcards designed by Margaret Evans Price. She was a noted illustrator in the 1910's - 1930's and was one of the co-founders of the Fisher Price toy company. This Margaret Evans Price postcard is denoted by the small initials MEP near the bottom right corner of picture. 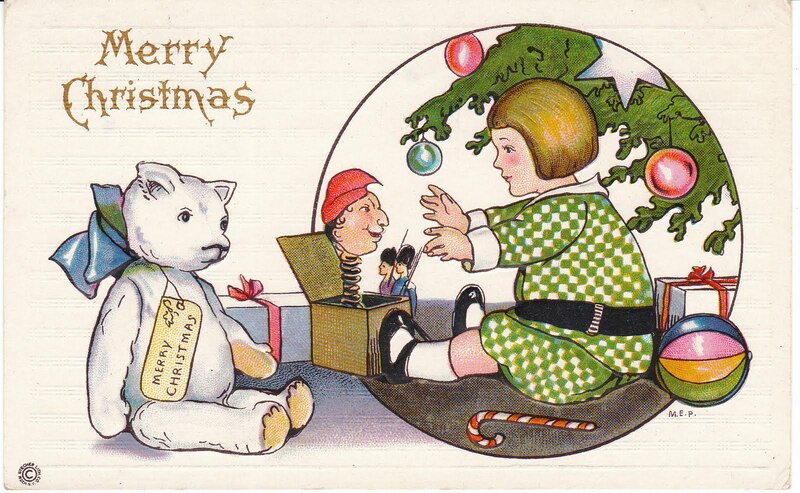 It reads "Merry Christmas" and is a Stecher card. In the foreground, we see a white teddy bear with a big bow around his neck. A little girl sits under a Christmas tree with a candy cane and ball, and she reaches for a jack-in-the-box toy. An especially lovely vintage Christmas card!